I heard from ちょこまる that today was a holiday in Japan. Starcrossed Day! I had no idea what the holiday was for. All I knew was that I was going to get a Bamboo Grass. I was hoping that it would be explained to me in ちびくろ (Chibikuro). Tortimer was just as confused as me. All he knew was that the holiday had something to do with romance. 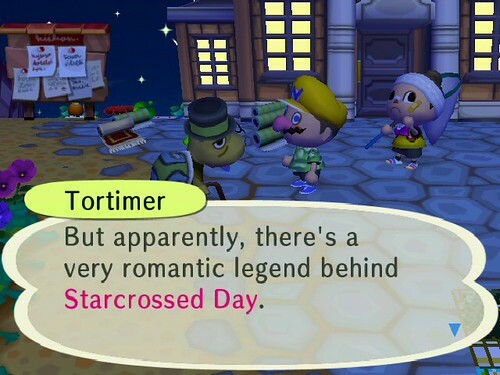 Thanks for nothing, Tortimer! When I asked ちょこまる what the holiday was about, he said today wasn’t really a holiday! I think something was lost in translation… So I guess it will remain a mystery! 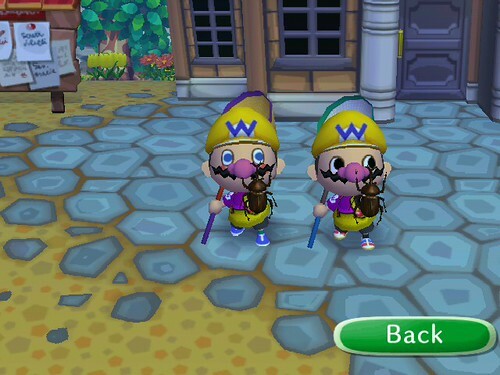 Not long after Chokomaru came to Shaolin, we were suddenly transformed into WARIO TWINS! 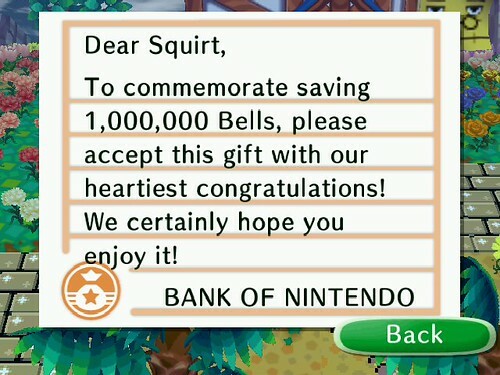 Apparently Nintendo had a little typo and wrote that I had only saved one million bells, instead of the TEN million I knew I had. Whatever, they still sent me the Piggy Bank! I proudly displayed it in the Nursery School themed room. Huzzah! New DLC is coming out on the 20th in Japan AND America, so keep your WiiConnect24 on!! Starcrossed Day is based of the festival of the seven heavens. There is a really long legend about it but the TLDR version is the girl got forbidden from seeing the boy and they are both imprisoned in the celestial stars. For a year, they never see each other but eventually, their love lets them come up with a plan and they are reunited. I know a lot about it because I am co-hosting a user-run event on a forum chatsite so if you have any questions, I am open to answering them. Grats on the 10 million! Now you have to haul around the bells to all the rest of your characters so they can get the bank too. That was a major undertaking for me. LOL.